For those who enjoy flying with their pets, many customers look to Southwest Airlines for travel options. The Southwest pet policy can be a bit strict at times, but it ensures that pets and their owners can travel both comfortably and safely. Ultimately, it’s up to the customer to understand the policies in place and to prepare in advance to avoid issues on the day of travel. If you wish for your pet to travel with you in-cabin during your flight, they will need to meet the requirements of the Southwest Airlines pet policy. You will also need to have an approved airline pet carrier. Southwest pet carrier regulations are very specific. The valid Southwest pet carrier size is 8.5 inches x 18.5 inches x 13.5 inches. When measuring Southwest pet carrier dimensions for a soft-sided carrier, ensure that the carrier is fully compressed. Your pet must have enough room to stand and turn within the carrier. Also, the carrier must have adequate ventilation as well as a waterproof bottom. Household birds, cats, and small dogs. Kittens and puppies must be at least 8 weeks old before they will be allowed to travel on a Southwest flight. Southwest Airways doesn’t ban any breed of cat or dog from traveling in the cabin during a flight. However, animals with aggressive behavior will not be tolerated in any way. Pets are banned from traveling on international flights. This restriction also refers to Puerto Rico. Before traveling with your pet, you must notify Southwest. You must also arrive early so that you’ll be included in the quota of allowed pets on the flight. Keep in mind that reservations can only be made in person. Also, ensure that your pet is transported within a southwest approved pet carrier. 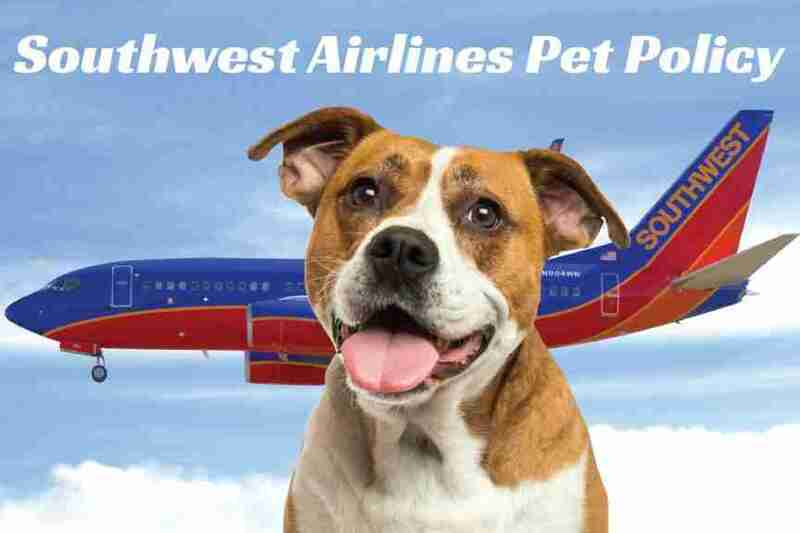 Southwest pet fees are fair (especially when compared to other airlines). Individuals will be charged a $95 Pet Fare (each way) for each pet carrier. As of this time, Southwest does not offer a checked baggage service for live animals. Southwest Airlines doesn’t allow pets in the cargo area on their planes. Southwest pet shipping remains exclusive to the cabin as of this time. Southwest Airlines accepts animals that are trained to perform a specific duty such as bomb-sniffing, drug detection, search and rescue, etc. without charge (only when accompanied by their handlers on official business). Qualified handlers traveling with a trained dog must present a letter of mission as well as a certification for the animal. Regulations dictate that these animals must not obstruct the pathway in any way as there should be a clear route of escape in case of an emergency. Also, law enforcement/search and rescue animals are not allowed to occupy a seat or sit in a row designated as the emergency exit row. Southwest Airlines has a straight and simple policy regarding emotional support animals. All animals that travel with their owners for the sake of providing emotional support are accepted within the cabin of the aircraft. All emotional support animals will be allowed to fly nearly anywhere with their owner (with the exception of Jamaica). More on that note, no animals of any sort are allowed to travel to and fro from the country of Jamaica (due to country-specific policies). All passengers traveling with an emotional support animal must provide Southwest Employees with the proper documentation. To book a reservation for a small cat or dog call Southwest Airlines at 1-800-I-Fly-SWA (1-800-435-9792). Seats aren’t guaranteed for pets. Pets will be received on a first come first serve basis. That means that pets will be booked onto the flight until capacity has been reached. Typically, Southwest flights offer only limited space for pet carriers, so it’s crucial that customers make their reservations as soon as possible. All pet fees are collected at the ticket counter and are nonrefundable. If the fee is not used, it cannot be used for future travel plans. All individuals traveling with a cat or dog must check in their pet at the Southwest ticket counter. After their pet has been checked in, they can proceed to their flight. Individuals are encouraged to obtain their tickets online, the airport kiosk, curbside check-in, or the ticket counter. As per Southwest’s policies, they will not allow pets to travel with their owners. Furthermore, pets aren’t allowed to travel with unaccompanied minors or on international flights. Southwest pet policies are in place to ensure that traveling with your pet is a safe and orderly process. As long as your pet meets all of the requirements and you abide by the regulations, it’s unlikely you will run into any significant issues. Of course, Southwest may change any of its policies at any given time, so make sure to do your research before booking a flight with your pet on southwest airlines. Lastly, you don’t need any additional paperwork to fly with an ESA besides an ESA Letter written from a licensed medical professional or doctor. how does a golden fit in front of your seat? When I helped raise a legit service dog he was trained to curl up under your feet ( a lab) but with emotional do they just stretch out? Thank you for the information. I got my terrier the esa letter from this website myesadoctor last month and was planning to take him on the flight with me. Thank you for sharing this information. Keep up the good work. Cheers.